Howitzers fall somewhere between guns and mortars, the other main artillery types. Like guns, they have limited mobility and are slow moving, but are they not as accurate as cannons. They do not fire straight at the target, but lob shots high into the air to plunge down on a target. The charge of powder and the barrel angle can be varied, which means a howitzer can send an almost-vertical shot over a wall. Given such an ability, they are best employed to bombard areas where enemies are concentrated. 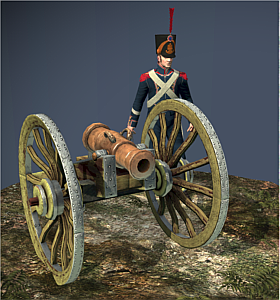 In close action, they can fire canister rounds directly into enemy formations, blasting them with hundreds of musket balls. Historically, howitzers were not easy to use. Ballistics was not a perfectly understood science and, apart from inaccurate targeting, a shell did not necessarily do any damage when it arrived. Erratic winds could send shells flying off course. Shell fuses had to be lit while still in the barrel, and the length of fuse judged to match the flight time. If the fuse was too short, the shell could explode in mid air; too long and the enemy might be able to put it out before the shell exploded!